Highly-anticipated second album from Brooklyn's pure metal alchemists that traverses darker paths than before. 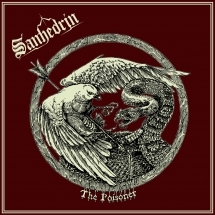 Brooklyn's Sanhedrin scale boundaries and elude genre norms on their second studio album, The Poisoner. The band's intoxicating blend of doom and classic metal is complemented by lyrics that delve into the darker elements of humanity and the cyclical nature of destructive ideas. Thought-provoking and inherently catchy at the same time, The Poisoner is indicative of a band unafraid to venture into unchartered territory. Sanhedrin's 2017 A Funeral for the World debut full-length was originally released independently, but reissued for broader release by Cruz Del Sur Music in 2018. The Poisoner picks up where its predecessor left off, with the Brooklyn trio (who consist of former Amber Asylum/Lost Goat bassist/vocalist Erica Stoltz, Black Anvil guitarist Jeremy Sosville and drummer Nathan Honor) parlaying their vast array of influences into eight gripping, instantaneously memorable numbers that rely melodic riff choices, the affecting vocals of Stoltz and touches of dark atmosphere. The Poisoner reflects the various sides of Sanhedrin, from classic, if not soaring jaunts, to tight, direct melds of gallop-oriented metal to doom-channeled motifs, most notably, the album's title track, which features a guest appearance by Stoltz's former Amber Asylum bandmate Kris Force on violin. This diversity is less of a jigsaw than it is the natural melding of various ideas and styles, taking Sanhedrin to new places on each song. On The Poisoner, Sanhedrin defies categorization, hereby entering into their own carved-out space where exploration and timeless songwriting are paramount.